When I was a child Telegraph Road was the boundary that separated the known from the unknown world. Most of what lay to the east of the highway was familiar – markets, schools, tracts of modest homes, and lots of churches – mostly seen from the backseat of the family car. But to the west of Telegraph stretched a vast oil field, prickly with towering derricks that cast long black lattice shadows across amber-colored soil. The ground had been saturated with a deadly liquid, sprayed everywhere from the backs of tanker trucks to keep living things from sprouting. If the wind blew hard enough to get the grimy earth airborne its acrid scent would haunt you until you bathed. So it wasn’t until I got a bicycle that I really saw the details west of Telegraph up close. Even if you’re a pale, quiet kid, if you ride with purpose, adults assume you are going somewhere. That something sanctioned is in play. Something more than a near-automatic response to insatiable curiosity. Each foray took me deeper and deeper into the wasteland. 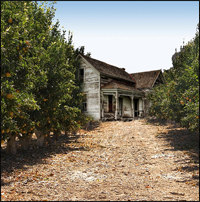 There I found an endless grid of dirt roads, old pumping stations, rusting chain link fences, and even the occasional incongruous cluster of small, unkempt houses with old cars or pickup trucks abandoned in the front yards. The bleakness was an irresistible fascination. And going to see it was emancipating. I was where children were not supposed to go. I was exploring on my own terms. As long as I kept moving I had a free pass. It was the harsh counterbalance to the rest of my experience. To the dull, safe, swept-porch uniformity of life to the east of the highway. It is no coincidence that too much has already been said about synchronicity, so I’ll “hop” straight into my narrative. 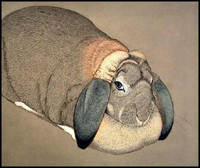 The most excellent bunny pictured at right is Sally, as rendered by San Francisco artist and printmaker Beth Van Hoesen. One day in the late 1980s, while walking west on Sacramento Street, Sally came to mind. I was on my way to see my shrink, Tanya, imagining what it would be like in a few minutes when I entered her office. On the wall just inside the door to the waiting room would be the handsome print of a rabbit. As I strolled down Sacramento Street, something struck me that I had not realized before. Tanya’s waiting room was not the first place I had encountered Sally. I suddenly realized Sally used to keep me company while I did my laundry. There is a coin launderette at the corner of Noe and 22nd Streets in San Francisco that I visited once a week during a period in which I was reading a lot of books on Jungian Psychology – and thinking that being in therapy with a Jungian might be a wonderful experience. On the wall above the driers hung an identical print of Sally. I was kidding, or at least half kidding, but the guy was not amused. Rather, he turned suddenly peevish. “That is SO Jungian!” he growled and stomped away a few paces. But then he stopped and stood shaking his head. After a couple of deep breaths he came back, asked me if I had a pen, and gave me Tanya’s phone number. “How funny,” I thought. Sally saw the odd encounter at the launderette that lead me to therapy with Tanya, and now Sally sees every time I come in for a session. Something on the sidewalk in front of me caught my attention. I was in that block of Sacrament between Buchannan and Webster, on the north side of the street in the cool shadow of the California Pacific Medical Center. At my feet was a quantity of cedar clippings, some raisin-like rabbit turds, and even a trickle of milky rabbit urine – the entire contents of a rabbit hutch sans the rabbit. “Tanya’s gonna love this!” I recall thinking. About fifteen minutes later when our session began I described the progression of recollections and discoveries related to Sally that I had just experienced. Tanya laughed and said, “The man who gave you my number is one of my graduate students.” I had not known that. “Did he tell you his name?” she asked. He had not. She laughed some more and told me her student’s name, but I didn’t get the joke so she explained. His last name – Lapin – is French for rabbit. The Wikipedia tells me that “In psychology and cognitive science, confirmation bias is a tendency to search for or interpret new information in a way that confirms one’s preconceptions and avoids information and interpretations that contradict prior beliefs.” Whew! Nonetheless, gentle reader, I confess that to my untrained eye, Sally looks very French to me. Perhaps someone who knows their rabbits will weigh in on the lovely creatures likely nationality. Merci !